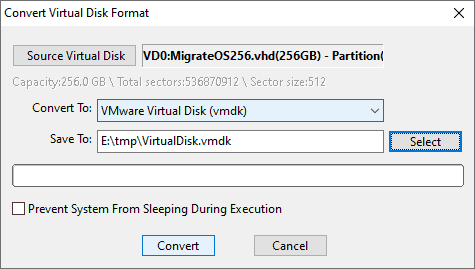 DiskGenius can manage partitions, recover deleted files and backup data for virtual disks including VMware (".VMDK"), Virtual PC (".VHD") and Virtual Box (".VDI"). It is an efficient converter to convert virtual disk format without data loss. Step 1 Click "Disk" menu and select "Convert Virtual Disk Format", as below. 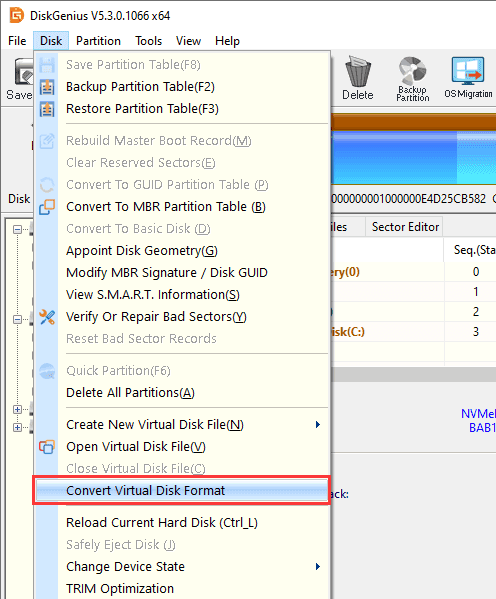 Step 2 Select virtual disk to be converted, choose virtual disk format and set path. Click "Convert" button and DiskGenius starts to convert virtual disk format. Source Virtual Disk: Click "Source Virtual Disk" button to select the virtual disk you want change format. Convert: Click the dropdown list to select a virtual disk format you want to convert. Save: Click "Select" button to name the converted virtual disk and set a location to save it.